About ¾-1 c peanut butter (the homemade above, or another natural peanut butter would probably work if you pour off the oil), well chilled in the refrigerator. Are you starting to feel like breast milk or formula and baby food isn’t enough for your little one anymore? Introducing solid foods is a fun time to be a parent. You get to live vicariously through your kids as they experience all sorts of new textures and flavors. I remember how fun it was when my son started solids. It’s something you’ll definitely want to get on camera! Before you start serving chicken nuggets, though, you should make sure your baby is really ready. If you offer solids too soon, you irritate their undeveloped digestive system or cause an unpleasant experience that would make it try in the future. Here’s how you can tell your baby is ready for solid foods. If your baby needs your support to hold his head up, then they probably are not ready to move to solid foods. Your baby needs to be able to maintain a steady, upright position to eat so they can effectively swallow without choking. For the same reason as above, your baby should be able to sit up unsupported for several minutes. When you put him in the high chair or feeding chair, much of the work will be done for him, but he needs to have strong neck and core muscles to get the food down without incident. Your baby should be able to move food to the back of their mouth and swallow it. That’s a tall request for someone who has only consumed liquids or paste-like baby foods. Start with small solid foods, but just large enough so he has to gum/chew them down a bit. If your baby is around six months and weighs double what they weighed at birth, then they could be ready to start munching on solid foods. Most babies are able to eat semi-solid foods at six months unless they have not been able to gain a healthy amount of weight. If you feel like your baby has not been gaining weight properly, you should get them checked by your pediatrician. The most important thing you should look for is interest. After a while, your baby will become interested in what’s on mom and dad’s plate. He’ll understand that you’re putting it your mouth just like he does with his food. He might even reach out for your food to try. You want baby to want solid foods so he’s more likely to enjoy the experience. I prefer to live a healthy lifestyle wherever I can. That’s especially true when it comes to the products and foods I offer my kids. Organic cooking is not that much different than cooking traditionally grown foods, you just have to keep an eye on your ingredients. Sometimes you have to make some substitutions, but there are plenty of incredible organic recipes out there. Here are some of my favorites. Skip the pesticides and extra sugar! These are perfect for the summer and easy to make in large quantities. Quiche is a great breakfast/brunch food for busy mornings because it can heated up and consumed quickly. Plus you can change the toppings to whatever foods your family prefers. Everyone loves cheesecake! Be sure to make this one while pumpkins are still in season so you get the freshest ingredients. This is a fun dessert because most people don’t have mousse on its own very often. Usually we use it as a filling, but it’s quite delicious. Kids love pizza! You can make them extra healthy by skipping the traditional dough crust for something healthier like zucchini. These have a ton of flavor and a nice texture (the soft vegetables and crunchy toast play nicely together). They’re better served as an appetizer than a stand-alone meal. These are great for snacks for the kids because they lots of healthy ingredients. Plus, they don’t require any cooking, just mixing, so you can whip them up quickly. Like the quiche I mentioned above, this frittata can easily be customized depending on your family’s preferences. Sometimes you just want a hearty meal, especially during this part of the year. This is a good one to serve if you have company visiting. This is a light meal perfect for when you dine alone. I wouldn’t recommend it for kids unless their tastes are really refined. As a mother, Jennifer understands the importance of offering nothing by the best for baby. Motivated by teeth marks on her children’s cribs, she decided to design a teething rail cover after trying products that didn’t measure up when it came to quality or style. What she found out made her even more concerned about children’s safety and health: The toxic chemicals used in the production of synthetic materials have been linked to birth defects, reproductive disorders, and weakened immune systems. She asked herself, “What if I could revolutionize the way parents decorated their crib with a safe and stylish teething rail cover that could be placed on the crib from day one?” Babee Talk® launched in 2014 with organic bedding and accessories. Chew-friendly, drool-friendly, and organic inside and out, her products ensure a healthy start in life for babies. She only offers products that she would provide for her own children. She hopes moms and dads will start to talk about the importance of choosing safe, healthy, eco-friendly products, especially for babies. I like Halloween (my kids do too), but I’m never pleased with the sheer amount of candy that’s available around this time of the year. People have bowls of it laying around their houses, they give it out at stores, and even teachers will hand out a piece now and then. I don’t think you have to be unhealthy to celebrate Halloween, so here are some alternatives to candy that I’ve found. Using your basic vegetable platter ingredients (carrots, broccoli, celery, peppers, mushrooms, etc. ), you can turn the traditional platter into something spooky. It’s simple to make and gives your celebration a lot of flare. I would skip the celery hair, though – that’s not very skeleton-y. With a little extra paprika and a tiny piece of celery, you can turn traditional deviled eggs into a Halloween-themed treat. The beauty of this recipe is that it’s just as simple as regular deviled eggs, so you don’t really need to learn a recipe. Once you see a photo, you can make them. 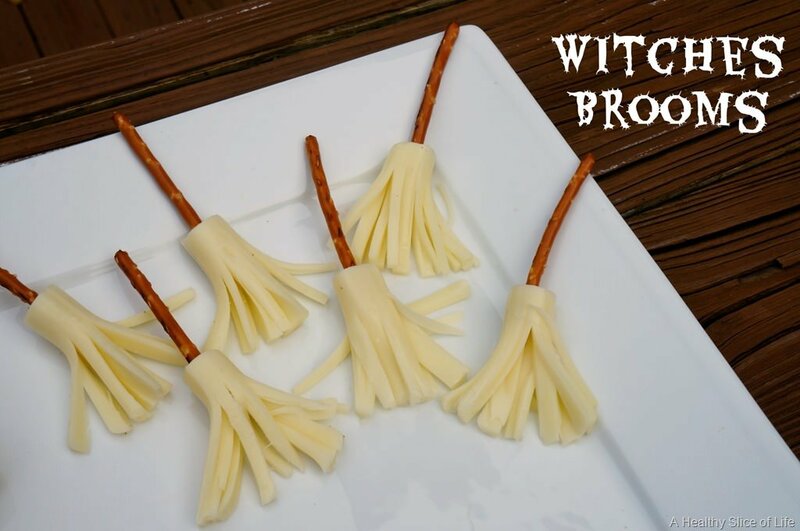 You can fashion these little crawlers out of basic ingredients. Use the peanut butter (or any type of nut-butter, or even cream cheese) to glue everything together. Even after they’ve sat for a while they’re still delicate, so try not to handle them much. These “pumpkins” take very little preparation at all. 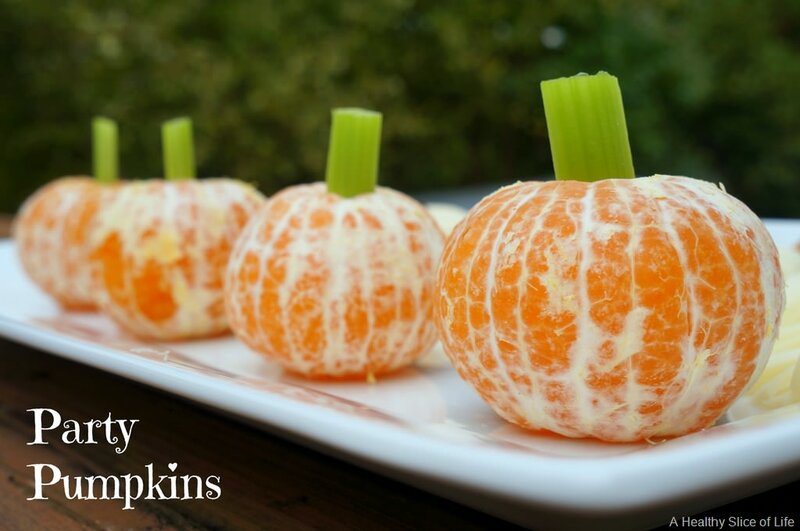 Peel a few tangerines and stick some celery in the top – ta da! Not much to it. These aren’t a ghost, skeleton, or mummy, but they still use Halloween colors. They’re great for a party of adults who aren’t easily impressed by vampires and other spooky characters. Simply cube and skewer melon and blackberries. Picky eaters… Every family has them. If you’ve got more than one child, chances are one of them is particular about the foods he or she eats. For whatever reason, some children just don’t want to be bothered with new tastes; they want to stick to the things they know and love. If you have a picky eater on your hands, it’s best to work to vary the child’s diet for their own health. Here are some ways you can deal with a picky eater. 1. Include your kids in cooking. Handling and cooking food can often “desensitize” your kids to trying new flavors. They become comfortable with the food and feel a sense of ownership over the meal they’ve created, which encourages them to try it. If your kids are old enough, you can do so far as to have them help you plan and shop for the food as well. 2. Mix healthy elements into their favorite foods. Use your kids’ favorite foods to transition to healthy ones. For example, if your son loves pancakes, add blueberries one time to see if he likes it. After a few attempts, you’ll have him eating blueberries on his own. You can also try carrot muffins, fruit in cereal, and smoothies with just about anything. 3. Keep the junk out of the house. It’s hard to combat all that junk food when it’s sitting right in front of you. Your best option is to keep it out of the house so no alternative is available. If your kids refuse to eat the delightful quiche you prepared, there isn’t a bag of cookies lying around for a late morning snack. 4. Repeat exposures. If you offer your child a new food and he doesn’t like it, don’t give up. Kids are naturally resistant to new flavors. Offer it a few more times (up to ten or fifteen!) on different days. Each time the flavor becomes more familiar and less offensive. You’ll be surprised what foods they eventually start to like. 5. Redefine dessert. By positioning dessert at the end of the meal, we tend to treat it like a reward. Plus, parents often give dessert or take it away depending on the child’s behavior, which makes kids want it even more. Redefine dessert as something healthy, like yogurt or fruit. 6. Create routines and stick to them. Try to serve dinner and snacks at the same time every day. Stick to this schedule. If your child refuses to eat what you provide at this time, inform them that there’s nothing to eat until the next scheduled time. If kids know they only get food on the schedule, they’ll be more likely to eat what’s provided. 7. Offer treats in moderation. If you cut out all the fun foods entirely, your kids will crave it and binge when you aren’t available to monitor them. It’s alright to offer a cookie here and there, just keep it to a healthy level. It’s so tough to teach kids to eat well these days. There are unnatural and unhealthy ingredients in our most inexpensive, most accessible foods. Kids can eat all the bad stuff they like as soon as they’re out of our supervision. It’s tough to monitor their diets. Even still, it’s important that we work to leave them healthy habits once they’re out from under our thumbs. Here’s how you can tech your kids to eat well. 1. Dinner time should be family time. In our modern, busy lives it’s not uncommon for the family to eat separately. A couple people eat together, another eats in the car on the way to practice, one eats leftovers when she gets home, etc. When we grab something quick or eat in a rush, those foods tend to be unhealthy. Have everyone sit down to dinner together so you can actively monitor everyone’s food intake. 2. Involve your kids in the food shopping. This isn’t always practical, but whenever possible, include your kids in the food shopping. As you shop, examine the packing labels and discuss the ingredients. Point out how not all foods are equal, and while some may quell hunger, they offer little or no nutritional value. The idea is to make understanding what they’re eating a part of the process. 3. Track down tasty foods. Foods and snacks don’t need to be laden with sugar to be tasty. In fact, after a period of abstaining from sugar, you would notice that sugary foods are nearly unbearable. There’s a lot of tasty and healthy options out there, you just have to find them. The unhealthy stuff is usually front and center because it’s cheap and easy for stores to stock. 4. Limit sugar and salt. These two ingredients are a big part of American food and while they’re fine in moderation, they a play a big role in the processed food we put on our store shelves. We don’t just find salt and sugar in cookies and candy, either. Large amounts are added into our staples, like bread, canned soups and vegetables and condiments. Avoid filling your child’s plate and forcing them to finish every bite. This creates an unhealthy behavior of eating just because food is available. If your child is honestly full, don’t insist they keep eating. We tend to make larger portions for ourselves than we need, but we finish it before our brain registers that our stomachs are full. Eat a bit less and you’ll be surprised that you aren’t hungry. 6. Keep a positive attitude. Kids (or anyone, for that matter) don’t like to hear what they can’t do. They like to hear what they’re allowed to do. When they ask what’s for dinner, tell them the menu with a positive attitude. Talk about how much you love green beans, peas, carrots and broccoli. Make it seem like a treat that they get to eat such great food. Praise them for eating well without being forced. 7. Serve as a good role model. Like all parts of parenthood, your kids are going to behave like you no matter what you say. You can’t tell them to eat healthy if you don’t do it yourself. Piling salad on their plates will feel like punishment if you’re skipping that course. Eat the same healthy foods your kids eat and do it with a smile. Creating hard, unbending rules is the best way to see them broken. If you banish sugary treats from your house entirely, you’ll make your kids crave them and binge when they get the opportunity. Most foods are safe in moderation, so don’t skip birthday cake because it isn’t healthy; let everyone live a little. Finally it’s cool to be GREEN! Rockin’ Green is made for families that care about taking care of themselves and the Earth. As a mom Kim was fed up with the empty promises of “green” cleaning products that were not delivering what they promised… So she invented Rockin’ Green! We can all do our part for the environment while doing something good for ourselves. All of our organic cleaning products are biodegradable, and gluten and vegan friendly. They don’t contain phosphates, SLS, Parabens, or optical brighteners. All of our packaging is made from recycled materials. Visit www.rockingreensoap.com for more information. In many houses, mornings are go-go-go time. Everyone has to get ready and get to work and school in just a few hours. As much as we would love to make an elaborate breakfast for our kids every day, it’s usually not in the cards. Here are some easy breakfast ideas to grab-and-go. Rather than pancakes, I prefer to make waffles for breakfast, especially when I’m in a rush. Since waffles are so sturdy, I’ll slice one into three or four strips and let my kids eat them with their hands. If we have a minute to sit down, I’ll let them dunk the waffle sticks into syrup, but if we’re on the move, I’ll sprinkle a bit of powdered sugar for flavor. My kids love bacon and eggs, but when we’re in a rush there’s no time to sit down. I’ll stuff some scrambled eggs, a few broken slices of bacon, and a piece of cheese in a flour tortilla. This gives them a proper breakfast, but they can eat it in the car. Smoothies are great because you can pack in just about any healthy food you like and hide the flavor with fruit. Kale and spinach are great for you, but good luck getting your kids to willingly eat those. If you blend them in a smoothie with a bit of Greek yogurt, berries and orange juice, the taste is completely hidden and you’ve got a vitamin-packed breakfast. Store in a few to-go cups and you’re off. I like to add little twists to traditional foods so they’re a tad more memorable. A bagel with cream cheese is pretty normal, but when you add a slice of tomato and cucumber, you get something special with a bit more taste. Also, more nutrients is always good. Muffins are easy to hold and eat while you’re walking or driving. My favorite thing about them is that you can make a few trays worth and keep them in the fridge for the week. If your family likes them hot, 30 seconds in the microwave will do. Mix ingredients like spinach, mushrooms, cheese, onions, and zucchini. Yes, you read that correctly. Instead of boiling eggs (I never get the timing right), you can easily bake eggs in their shells for thirty minutes at 325-350 degrees. Put them in muffin trays so they don’t wiggle around or fall on one another. Once finished, rinse them in cold water to cool them down. (The brown spots on the shell are normal and harmless). This is basically an egg sandwich without the bread. Scramble some eggs and pour into a greased muffin pan. Add chopped ham, onions, cheese and any other vegetable you like. Bake until the eggs are cooked well and they should pop out like muffins. Voila! Egg sandwich without any mess. By microwaving your favorite cereal with marsh mellows, you’ll create a sticky, pliable concoction. Let the marsh mellows harden a bit, then mold the cereal into a rectangular bar for easy eating. Make seven on Sunday for the week and keep them in the fridge. Crispy hash browns are a favorite of kids, but usually you have to eat them with a fork and plate, unless you buy the frozen patties, which I’m not a fan of. Spray your waffle maker with cooking spray and lay your shredded potatoes in a waffle-like pattern. After cooking, they’ll stick together like a patty for easy hand-holding. Solid food are an exciting and important step in your baby’s development. From a parent’s perspective, you’ll get to enjoy watching your child’s face as he or she experiences countless new flavors and textures. Studies show that children who eat nutritious foods at a young age continue those habits for years. Making baby food at home is simple. With fresh foods and a blender, you can puree regular food quickly and freeze them in single-size servings for later meals in the week. You can make weeks worth of food at a time. Here are five reasons you should make your own baby food. Taste it for yourself! The smell, taste and color is different. Compare a jar of baby food to a fresh equivalent product. The baby food might not raise any alarms on your tongue, but once you try the fresh food, you’ll immediately recognize the difference. When your child is young, you want to expose him to as many foods as possible so he enjoys different tastes, especially the tastes of healthy foods. It’s important to offer the best tasting options you can manage so he’ll prefer the healthy stuff. You can even introduce herbs, spices and textures that baby food manufacturers wouldn’t. Baby foods are developed for the mass market by giant manufacturers. They limit the variety of the foods they offer to the ones that are popular (so they’re purchased) and easy to produce (so their costs are reduced). However, variety is important to a balanced diet. Your local grocery store or supermarket will have a large selection of fresh and frozen fruits and vegetables that should play a role in your child’s diet. As a parent, you want to understand and trust every substance you put into your child’s body. By preparing your own baby food, you can be assured of the quality, safety and consistency of each ingredient. If you choose, you can eliminate salt, sugar or butter. If you’re concerned about pesticides and herbicides, you can use organic produce. If you use store-bought food, you give up these choices. The more involved you are in your baby’s food intake, the more likely you’ll be able to nurture lifelong, healthy eating habits. Regardless of their simplicity, baby foods are expensive. The average baby in the United States consumes 600 jars of baby food over the course of his life. In the first year, that works out to about $300 if you bought off the shelf. By making your own baby food, however, you can reduce that first year’s cost to about $55. If you’re a budget-watcher, that’s a big savings. At such a young age, vitamins and nutrients are critically important for your baby’s growth and development. Processed baby foods have added water, preservatives and fillers. While these ingredients aren’t harmful, they dilute the nutritional content. That jar of yellow squash isn’t entirely squash. Further, in order to store foods, they first have to be heated to a high temperature to kill bacteria. This process can destroy some of the nutritional content as well. Sign up for the Babee Talk newsletter to receive blogs, news, updates, promotions, coupons, and giveaways.